On Thursday this week, Holy Thursday (or Maundy Thursday in Britain), Catholic cathedrals around the world will be conducting a special olive oil blessing, the Chrism mass. All the oil to be used throughout the year for confirmation, ordination and anointing the sick and dying will be consecrated by the local bishop. My birth name being Olivia, the ancient name of the goddess of the olive groves, I always loved this ceremony and naturally feel a special affinity for olive trees. Olives were loved across the ancient Mediterranean world and have been cultivated in the Levant for over 6,000 years. 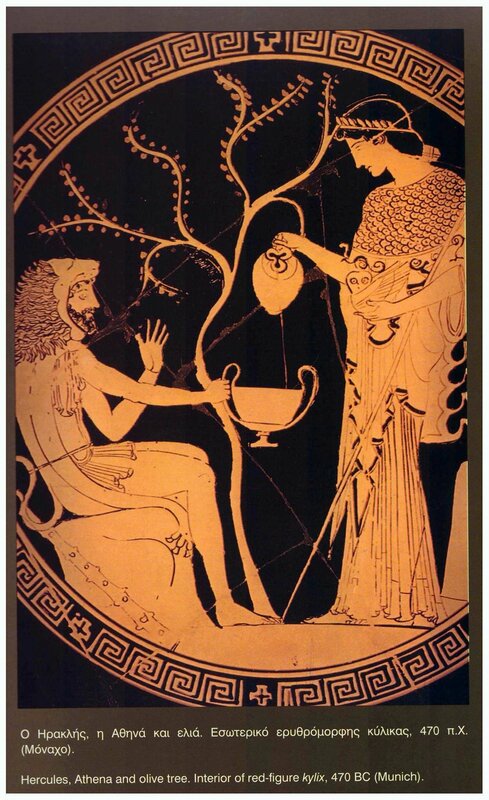 In Greek mythology, the creation of the olive tree was the result of a contest between Athena, Goddess of Wisdom, and Poseidon, God of the Sea as to who would be the patron of a newly-built city in Attica. Poseidon struck a rock with his trident and water gushed forth, creating a spring of salty water. But then Athena struck a rock with her spear and produced the olive tree. The citizens chose the gift of Athena --peace, plenty and fruitfulness. And so she forever became the patroness of the city, named Athens to this day. The athletes competing in the Olympic games were massaged with olive oil and the victor was crowned with a wreath of olive leaves. The Romans similarly saw the olive tree as the gift of Minerva, goddess of wisdom and healing, while to the Egyptians, Isis bestowed the olive tree. The olives have their own Catholic saint as well--Saint Olivia of Palermo, a Sicilian noblewoman who was martyred in Tunis, or so her legend goes. She is still the patroness of Tunis, whose cathedral today is dedicated to St Vincent de Paul and St Olivia. Even more remarkable, the grand mosque of Olivia, the oldest mosque in Tunis, is said to stand over her tomb, and she is revered by the Muslims of Tunis. Noah's flood finally came to an end when the dove returned to the ark bearing an olive branch--showing that dry land had appeared again. The dove with the olive branch has become a symbol of peace, as has 'holding out the olive branch.' Jesus spent the last night before his crucifixion in the olive grove of Gethsemane, while St Francis made his hermitage on Mt Subasio beside an olive that is growing to this day. Today olive oil is revered as a bestower of good health, due to its content of oleic acid and other monounsaturated fats. 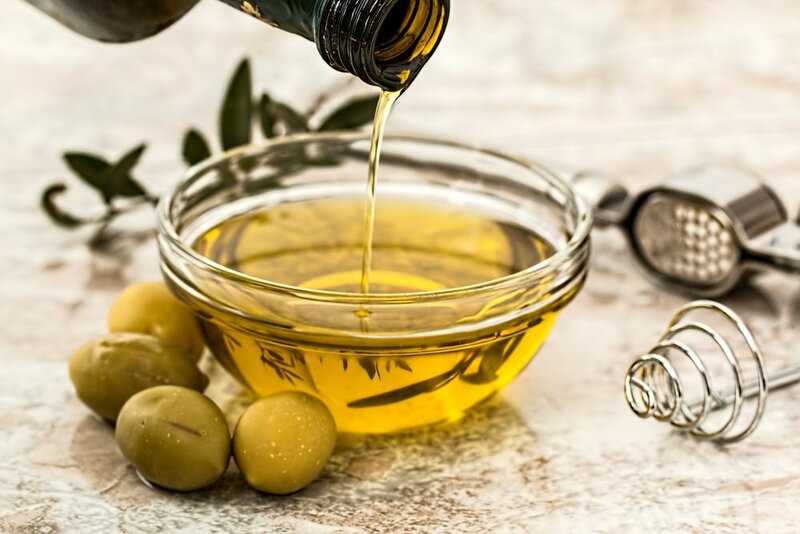 The main fat used in the Mediterranean diet, olive oil consumption is associated with a low mortality from cardiovascular disease, as summarized in a review article by Marıa-Isabel Covas. The olivey taste of olive oil is associated with special phenolic antoxidants, oleuropein, hydroxytyrosol and tyrosol, while carotenes and tocopherol (Vitamin E) are also important components. Buy oils bottled this year, or within their 'best by' date. Prefer PDO and PDI olive oils, coming from a protected geographical location. Fair Trade olive oil is also available. For my birthday I got Rumi Tree olive oil from Palestine, sold at our local fair trade shop. Another confusing issue about olive oil is the claim some make that 'you shouldn't cook with olive oil.' This is not true. And were it true, the entire Mediterranean diet, demonstrated to be so healthy, would be invalidated. Olive oil smokes at 420'F, a far higher temperature than the 'sizzle point' at which you can effectively stir-fry or sauté your food. Some studies have subjected olive oil to high temperatures (below its smoke point) for long periods of time without destroying its special phytonutrients. I'm leaving the references at the end of the article in case you need further convincing. However, since some of the olivey flavor is lost in cooking, Spaniards and Italians (and Alakananda & Sadananda too) always add some extra, fresh olive oil at the table. Olive trees should never be harmed, even in war. As it says in the Book of Deuteronomy in the Torah, 'Are the trees your enemy, that you should attack them?' They give us so much--shade, shelter, wood, olives and oil. (Deut. 20, 19). As gifts of the Ancient Mother, the trees and those who tend them deserve our love, respect and protection. 1. Bastida SS-M, FJ. Thermal oxidation of olive oil, sunflower oil and a mix of both oils during forty continuous domestic fryings of different foods. Food Sci Tech Int 2001;7:15-21. 2. Gennaro L, Piccioli Bocca, A, Modesti, D, Masella, R, Coni, E. Effect of biophenols on olive oil stability evaluated by thermogravimetric analysis. Journal of Agricultural and Food Chemistry 1998;46:4465-4469. 3. Allouche Y, Jimenez A, Gaforio JJ, Uceda M, Beltran G. How heating affects extra virgin olive oil quality indexes and chemical composition. J Agric Food Chem 2007;55:9646-54. 4. Cicerale S, Conlan XA, Barnett NW, Sinclair AJ, Keast RS. Influence of heat on biological activity and concentration of oleocanthal--a natural anti-inflammatory agent in virgin olive oil. J Agric Food Chem 2009;57:1326-30.